WARNING: THIS VERSION IS NO LONGER SUPPORTED, RECOMMEND USING "ServiceNow v2". This article provides a description of the ServiceNow Plugin built for TruSTAR. This plugin allows users to utilize context of TruSTAR’s IOCs and incidents within ServiceNow workflow. TruSTAR arms security teams with the high signal intelligence from sources such as internal historical data, open and closed intelligence feeds and anonymized incident reports from TruSTAR’s vetted community of enterprise members. This integration is an update set XML file. You can download it here. This XML file contains all required ServiceNow objects Metadata to run TruSTAR's integration in ServiceNow. The following bundles are required for successful install of the TruSTAR app. This update set XML file contains all the actions required to support TruSTAR actions from ServiceNow. Select XML update set provided in deliverables and click Upload. Once Upload is finished click TruSTAR upload set and open. Click on “Preview Update Set” button. Click on “Commit Update Set” button. Go to Navigation Menu and type TruSTAR. We can see TruSTAR Menu. This section describes steps to configure TruSTAR Integration. We need to setup TruSTAR Endpoint, API Key, and Secret Key etc. NOTE: If you have multiple enclaves you can enter them as comma separated values of enclave id’s. This section describes how to setup the user access permissions that is needed to fully configure and use the TruSTAR integration. You need access to two roles in ServiceNow to access TruSTAR menus. This describes the process of upgrading the TruSTAR plugin and application in ServiceNow. The old update set and application needs to be removed from ServiceNow and updated to the newer version. Type/Select “delete” in confirmation dialog. Once we create security incident the TruSTAR integration will trigger Submit Report event to TruSTAR. This report will be submitted to the enclave(s) you have identified in your configuration. Below image shows submitted report security incident work note detail. It contains deep link to the TruSTAR station. Once you click on this link it take you to the case in TruSTAR. Once a security incident is successfully submitted to TruSTAR the work notes section will show the count of correlated TruSTAR reports for IOCs in that case. Below image shows correlated report work note details shown in security incident. It shows correlated report count found in TruSTAR. Once a security incident is successfully submitted to TruSTAR the work notes section will show correlated TruSTAR IOCs. Below image shows correlated indicator work note details shown in security incident. It shows correlated indicators with deep link to TruSTAR station. 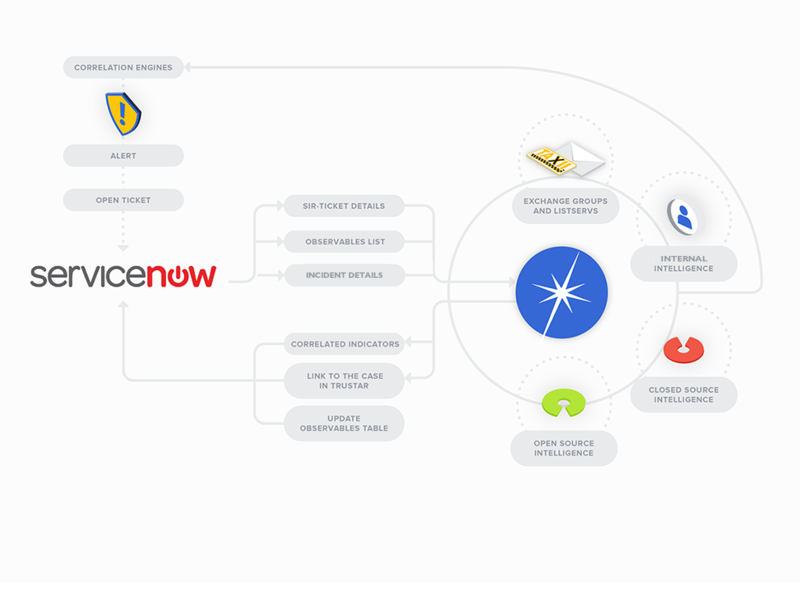 The TruSTAR platform is constantly updated with new IOCs, which could provide enrichment for an existing ServiceNow security incident. This integration updates correlated indicators found in TruSTAR in Associated Indicators tab for created incident. Please reach out to support@trustar.co for any additional questions.